Maryland's leading Eastern Shore golf course has two finishing holes that are destined to be some of the region's most talked-about. The 17th is a par 3 that stretches 200 yards from the tips. Awaiting the bold player is a dramatic carry over Shoal Creek to a large putting surface guarded by three artfully crafted bunkers. The green is backdropped by majestic trees and a stunning vista of the broad Choptank River that flows into Chesapeake Bay. As spectacular as the 17th is, it merely sets the table for the truly beautiful 18th. This classic risk/reward hole is reachable in two by big hitters. The Choptank River runs along the hole's left side from tee to green, as does a vast coastal bunker that meanders into the wide fairway at the prime second-shot landing area. Stately oak trees sit sentinel along the right side of the fairway. With a Sunday pin placement just a few feet from the scenic Choptank River and tucked behind the greenside bunker, resort guests will get a chance to experience the thrill of playing one of the finest finishing holes in golf. We invite you to play through a round on one of Maryland's best public golf courses. Please call 410-901-1234 for current rates. Call 410-901-1234 for rates and tee times. Contact Hyatt Regency Chesapeake Bay Golf Resort, Spa and Marina at 410-901-1234 for more information and details on holding a golf outing at the course. Contact Hyatt Regency Chesapeake Bay Golf Resort, Spa and Marina at 410-901-1234 . 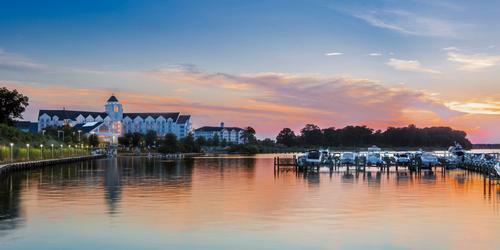 Contact Hyatt Regency Chesapeake Bay Golf Resort, Spa and Marina at 410-901-1234 for onsite or nearby dining options. This profile was last updated on 02/08/2019 and has been viewed 2,873 times.